Do you suffer from sensitive teeth to hot or cold foods? Tooth sensitivity is a common issue that will occur from time to time. Sensitivity to hot and cold foods are one of the most commons alarming symptoms. Often times the issue is not severe or serious, but if it’s a consistent occurrence then you may be suffering from a dental condition known as gum recession. Gum recession is the dental term used to describe gums that have pulled away from the gum line – exposing the tooth’s roots where the nerves are stored. Sensitivity to both hot and cold foods is a main symptom because when the foods or drinks collide with your exposed tooth roots – pain is caused. Gum disease is often blamed for the primary cause of gum recession. Untreated gum disease will gradually eat away at the gum tissues, causing your gums to pull away, enough to the point where there is no more support. In severe cases of gum disease, teeth can fall out because of a lack of support and permanent damage to the jawbone and gums may occur. 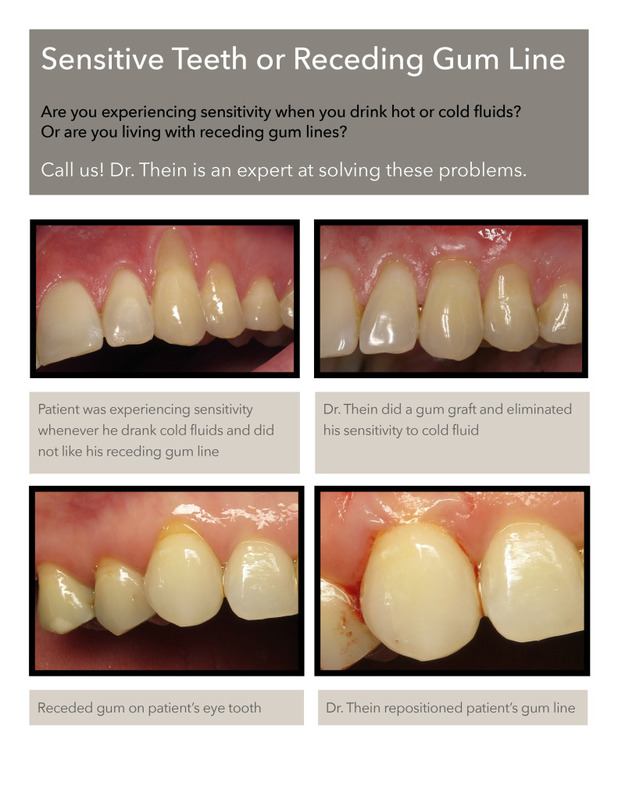 Below you will find Dr. Thein’s actual work of a gum graft being performed on an actual patient who was experiencing tooth sensitivity that did not resolve on it’s own. Gum grafting is a great solution to correcting gum recession by restoring the natural bond and eliminating the obnoxious pain associated with sensitivity to hot and cold foods. The idea behind a gum graft is simple: take tissue from one area of your body and transfer it to your gums in order to correct an eroded gum line. 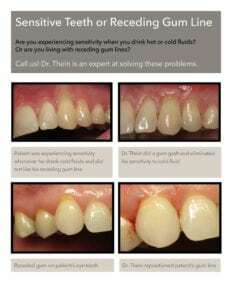 Dr. Thein uses a deft hand and skilled technique to help restore the gum tissue surrounding your teeth. Tissue is often taken from the roof of your mouth, underneath the palate, or from adjacent healthy gum tissue. Each case is unique to how severe gum recession is. Call our office or set up an appointment online, to determine see if you are a candidate for gum graft surgery.